Buried somewhat beneath the list of finishers in the boys 2-mile championship at New Balance Nationals Indoor on Sunday was an athlete from West Virginia who finished 18th overall. So it would have been easy to to gloss over Larry Josh Edwards' race, considering the Morgantown University High School freshman ran in the first heat and finished seventh. But one look at the time forces you into a double-take. Edwards put down one of the best freshman distance performances of all-time against a majority field of seniors, finishing with the fastest time in the class since 2011. In 2020, he'll be the second fastest returner back. Few young athletes Edwards' age have run faster than 9:12.85 for 2-miles all-time, and one among them includes national class record holder Lukas Verzbicas, who ran 8:57.55 in 2009. That record may be tough to eclipse for some time, but Edwards certainly has the potential to go after a sub-9 sooner rather than later. Because comparatively, he had done so before. Roughly a month prior, Edwards posted a time of 9:12.28 for 3200 meters at the MileSplit/SPIRE Showcase in Ohio, setting a new No. 1 for freshman at the distance. A simple comparison over the years shows what kinds of athletes he passed. 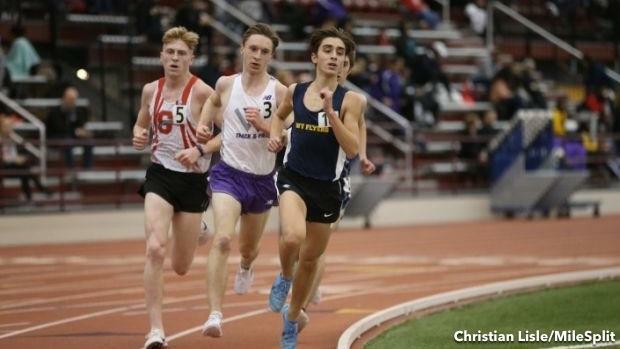 Back in February, another young distance runner, Aidan Puffer of Manchester (CT) High School, ran 8:47.95 for 3K at the Yale Track Classic, which set what was then a new freshman class standard for 2019. But even then that time would have converted to 9:30.03 for 2-miles -- Puffer faced injury ahead of New Balance Nationals Indoor, which forced him out of the race. Outside of the 2-mile, Edwards is also ranked No. 2 for freshman at 1-mile (4:25.12). This past fall, he ran a PR of 15:42.99 at a Group race in West Virginia (fourth best for freshman this fall), then finished second at his state championships. He then won the freshman 5K race at Foot Locker South in November. And if nothing else, this past week forces an eye on the West Virginia athlete, whose progression is fast-tracking toward some incredible efforts thus far.